Hopes are running high that a problem football pitch serving over 300 aspiring young players in the South West will return to full commission following one-metre deep de-compaction treatment. Bradley Stoke on the outskirts of Bristol, a high density development built in the 1980s and 90s has a thriving youth football club catering for under 7s to under 18s (as well as an adult club) but up until now one of the two town pitches has been unplayable for approx. 50% of the season. "This pitch has always been poorly drained," says John Connell, M.D. of Classic Landscapes who has been in charge of grounds maintenance for Bradley Stoke Town Council for the past five years. 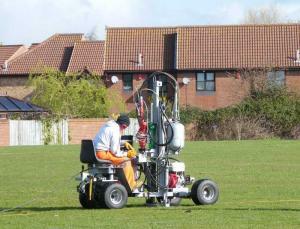 "We've tried the usual aeration methods, verti-draining helped but it didn't cure the problem. We know that a drainage system is in place but the water is not getting through. I suspect that the pitch was badly built in the first place." David Green, M.D. of Terrain Aeration, whose company was called in to treat the pitch, agrees. "Despite the fact that it's surrounded by relatively flat ground the pitch is situated on a raised plateau," he says. "It's certainly made-up ground and there doesn't seem to be any reason for it." After two days working with Terrain's Airforce Scamper Terralift machine, inserting the one-metre, steel probe and injecting compressed air at 18 bar, to create subterranean fractures and fissures rising all the way to the surface, Green suspects that the site may originally have been a dumping ground. "The sub soil is compact, yellow clay with the permeability of a house roof," he says, "but we've also been finding bricks, concrete and rubble." Now that the entire underground area has been de-compacted to a depth of one metre with dried, milled seaweed (which swells when wet) injected on the final air blast to keep the newly created air channels open the way should be clear for water to travel from the surface to the drains. "Our aeration treatment should be the first stage of recovery," Green continues. "Compaction leads to poor grass growth, followed by weed invasion and lost levels as the exposed top soil is eroded by wind when it's dry and turns to mud when it's wet." Classic Landscapes should now be able to begin a programme of weed suppression followed by scarification, top dressing and re-seeding. "Every Saturday we've got over 300 boys wanting to play football," says John Connell. "We've created a few small, practise pitches on the cricket outfield but what we really need is our second full size pitch, back into play. It rained during the night after the first day of de-compaction treatment and judging by the condition of the pitch the next morning I'd sy that initial indications are promising."